The RDS LOADMASTER Alpha 100 is an all-new CAN based system setting a benchmark for the industry combining cutting edge sensor technology and signal processing techniques providing precise and consistent weight information. Loadmaster Alpha 100 loader scales are an advanced onboard weighing system specifically designed for wheeled loaders operating in the toughest industrial environments. This system is also suitable for Telehandlers and Forklifts. With the ever-increasing focus on productivity, LOADMASTER Alpha 100 loader scales have been designed to operate within the fastest loading environments and toughest of conditions compensating for uneven, sloped ground and restricted loading areas reducing cycle times and maximising tons per hour performance. Loading correctly first time eradicates return trips to the stockpile reducing vehicle movement, fuel usage and machine & tyre wear. The RDS LOADMASTER a100 uses a 7” colour, resistive touch screen display and additional physical keys providing a modern and ergonomic operator interface. Suitable for use with up to 10 different attachments e.g. buckets or forks, the system can be retrofitted onto wheeled, telescopic and tractor type loaders. The system continually measures hydraulic pressure using up to 4 sensors. The pressure signals are captured and filtered through a weighing ‘arc’ provided by inclination sensors measuring the angle of the main boom. All signals are processed in the RDS Smart Box and the resultant weight calculation is sent to the terminal mounted in the cabin. Video input for switching head unit into reversing camera mode removes the need for additional screen, releasing valuable cab space. 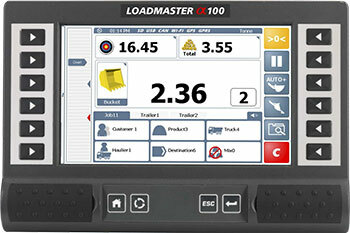 The Loadmaster Alpha 100 loader scales can be upgraded to trade approved version. Optional printer and reversing camera can be added, and various data options are available. New dynamic weighing technology using accelerometers, enabling superior weight accuracy and repeatability in difficult conditions and terrains.